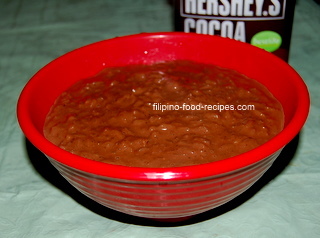 This champurrado recipe Filipino version is a sweet chocolate rice porridge, a popular Filipino breakfast or snack, and often served hot with Tuyo (Salted Dried Fish). It is made from glutinous or sweet rice, cocoa powder and sugar. Milk is added to make it creamy. I added instant coffee to make the chocolate flavor deeper and more pronounced (which I learned from Ina Garten of the Barefoot Contessa show on Food Network). I particularly specified 'Filipino version' to distinguish it from the Mexicans' Champurrado which is a real thick hot chocolate and spice drink. 1 Boil the water and add the glutinous rice. 2 Cook for 10 - 15 minutes until the rice has fully absorbed the water, mixing occasionally. 3 Add the dissolved cocoa powder, instant coffee, condensed milk, sugar and pinch of salt. 4 Cook for 5 minutes or until everything is thoroughly mixed. Add a little water if the mix is too thick. 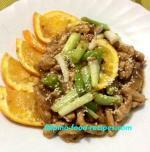 5 Serve hot as it is or with Tuyo. Don't make the mistake of adding the cocoa powder directly onto the hot pan without dissolving in water first, you will get lumps of cocoa powder that's bitter when eaten. The champorado may look too 'white' from the milk but the color settles once it cools down a bit. If you would rather have the milk served on the side, omit the condensed milk but make the sugar 1 and a half cup instead of 1/4 cup. A pinch of salt brings out the sweetness in any dessert so you don't need to add too much sugar to get the desired sweetness.